“Painting is my life’s inspiration.
. . . the fullness of infinite possibility . . .
. . . not “knowing” where to go or what to paint . . . Architect Andrea Traber started painting about 20 years ago, three years before she took refuge in the Dharma. She originally became an architect because she had always felt strongly engaged with her outer landscape, and the built environment. As a child, she remembers visually and experientially appreciating her surroundings, whether the house, a park, or being in nature. While she has loved her career as a residential and commercial architect for 25 years, she migrated over to design consulting for sustainability, being deeply concerned for the future of our planet. And although she no longer does much architectural design, she still considers herself an architect. 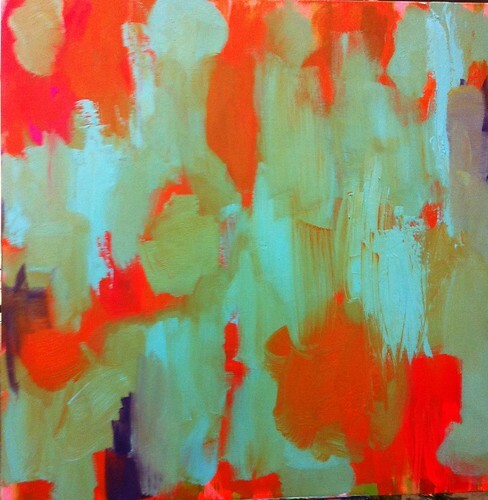 Along the way, she discovered an intense love for abstract painting. Her paintings are very colorful, playful, and joyful, although sometimes the shadows come out. Having recently been through a major life transition, Andrea made three or four paintings dominated by black and red strokes, incorporating words as part of the composition, as a form of catharsis. She doesn’t consider these paintings to be beautiful but explains that the dark side of life is just as valid as the lighter, more uplifting aspects. Moving away from the line drawings and orthogonal plans of architecture, Andrea wanted to explore new media and materials by using her body and mind more creatively. She began to paint her own inner landscape, in relation to the outer landscape—what she saw, felt, and experienced. Her landscape painting became fantastical and abstract rather than representational, leading her to play with what she saw, without taking it literally. For Andrea, traditional landscape painting cannot possibly capture all that is seen because it’s so vast and overwhelming. So rather than attempting to frame a limited view and paint that—her work naturally became very abstract. She describes it as almost being an antidote or polar opposite to the creative work she did as an architect. The two enrich each other extremely well for Andrea. 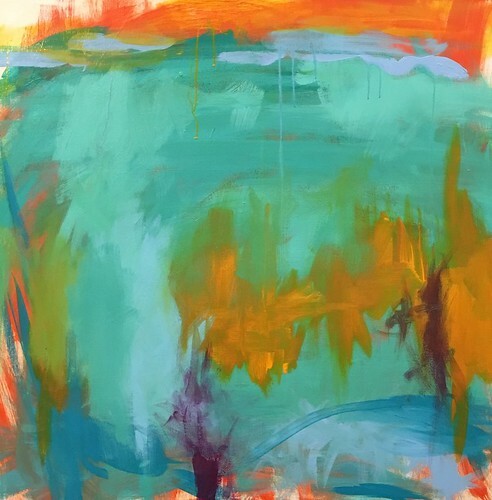 Artists enter into abstract painting in different ways—some work with lines, space, composition, graphic elements, even words, but for Andrea, those approaches are not appealing because they are too formal. She resonates more with breaking away from structure. She had one teacher who instructed the class to paint on paper, putting whatever colors down and then ripping it up, destroying it and putting it back together in a new and interesting way. By doing this, the students destroyed attachment to the original concept of the piece, which Andrea found extremely liberating. From that point, Andrea never looked back. She simply kept going with the color, texture, body, and richness of the materials in themselves—watching paint drip, the way drips meet and mix, and the alchemy of all that happens when accidents are allowed. For Andrea, it was amazing to accept that there are no mistakes, just things that happen. She felt completely liberated to experience the moment and to be okay with that; without judgment. At the same time, she found that she could make decisions, edits, or judgments later, even after years had passed, wherein she might cover over a painting, having lived with it for some time, realizing she no longer liked it. It’s kind of taboo in the art world to just gesso over a painting and start over. People are convinced that the initial inspiration was valid and one has to work it until it’s “right.” Andrea has a different view on that—she says that even though the inspiration was valid at the time, she can choose to paint over it. All the original texture, body, and shadows still come through, and she finds that very interesting to work with as a foundation. Andrea didn’t start out painting as a practice, but it has evolved into one. Now when painting she will sometimes write a poem. By tuning into that creative side, what emerges could be feelings, words, visions described with words, and such, so that now she has also been writing before she paints. Sometimes the painting that emerges is related to the words or feelings. There is always a kernel of vibrancy that connects the words and the visuals. Since she has always been more of a visual artist than a poet or writer, Andrea wonders if engaging the visual aspect has opened up the words, speech, and ability to communicate—it seems one has helped open up the other and she really loves to write now. 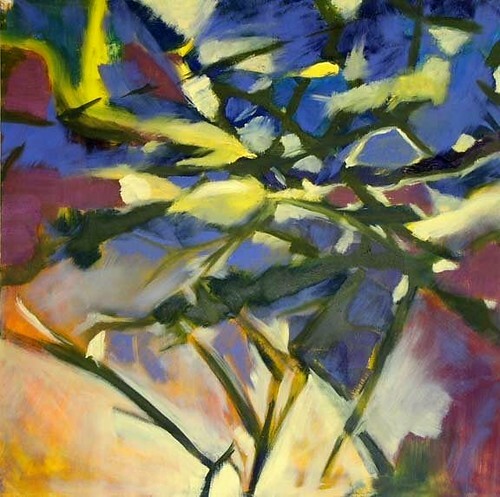 In Andrea’s work, color, and composition are closely related. The striking oranges and blues, teals, purples, and other incredibly bright and deep hues match the richness of her attitude and demeanor toward life. Like her art, Andrea is a very buoyant, sensual, and lively person. Yet sometimes there are more monochromatic tones—luscious deep blues with darker purple, and while still colorful, a very different feeling is present in these that one could just sink into. Even in the monochrome, there is texture and a subtle shift of color and composition—there’s that little surprise of an intense experience. Her brighter multicolored paintings are, in a way, more heavy-handed with vibrancy and radiance, so she limits—by editing out, changing, or modifying—to avoid total chaos or a cacophony of vibrancy. The editing process helps convey the intention of a piece. The process is a back-and-forth between intention, inspiration, manifestation, and fruition into the resolution or coming together of a painting. 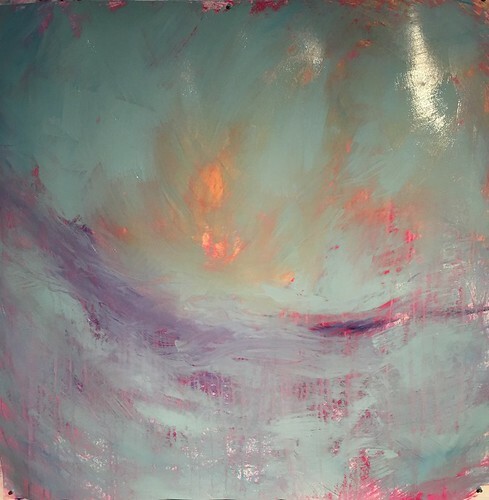 Recently Andrea has been using her hands more, scratching, hand printing, and using her entire body while painting on larger canvases, using the whole arm over a canvas, or even two big canvases at once. What emerges in these cases is a conversation between expansion and subtlety. Some new pieces are quite large—6 x 7 feet—where one could feel as if they were walking right into the painting. It’s a new frontier for Andrea. In our environs, the outer rooms we design and live in, and the inner worlds we inhabit, where feeling, sensation, thought, and awareness collide, we are the masters of our own experience. On the path of meditation, nothing is left out; everything is part of the journey. May our path to awakening be illumined with bold color, joyful brushstrokes, and the abundant facets of our experiences of being fully human. * From Abstractions, a statement by the artist. ** Personal conversation with the Artist, 12 August 2017. A Vajrayana Buddhist practitioner since 2000, Sarah C. Beasley (Sera Kunzang Lhamo) spent more than six years in retreat under the guidance of Lama Tharchin Rinpoche and Thinley Norbu Rinpoche. She is an experienced teacher, writer, sculptor, photographer, dancer, and Iyengar yoga practitioner. Sarah offers a workshop, “Meditations for Death, Dying & Living,” based on the text Vajrasattva Ceremony for the Dead (Concise Nay Dren). For more information, visit Moondrop.